Admission Process - Arrowhead West Inc. Meets the State of Kansas definition of an Intellectual/Developmental Disability (I/DD). To receive day or residential services, a person must be 18 years of age or older. Exceptions apply when a contract is initiated by area school districts for students 16 years of age and older. Person from a division’s catchment area shall have priority within the division if they so choose. Capability of agency to meet the needs of the individual. An expressed interest of the individual and/or family willingness to cooperate in the provision of services. Not considered a danger to self or others. Does not abuse alcohol or use illegal drugs. Health assessment within last six (6) months. Psychological evaluation within past two (2) years. Funding source to meet the individual’s identified needs. A person with a communicable disease will first be referred to the Health Advisory Committee. Step 1: Contact the Community Developmental Disability Organization (CDDO) in their area. The CDDO is responsible for determining eligibility for Arrowhead West, Inc. services. 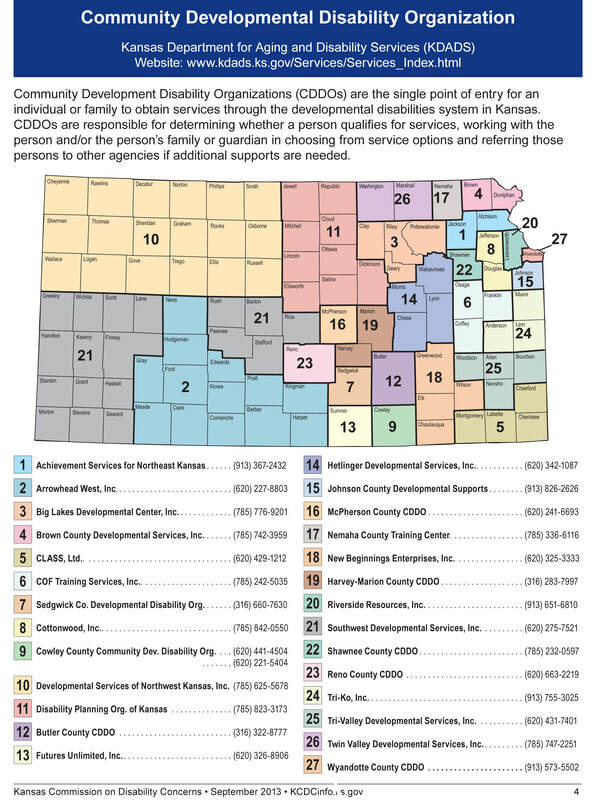 In Sedgwick County, the CDDO is the Sedgwick County Developmental Disability Organization (SCDDO). They can be reached at (316) 660-7630. In all other counties of the catchment area, the CDDO is Arrowhead West, Inc. They can be reached at (620) 227-8803 in Dodge City or (620) 933-2215 in Medicine Lodge. Step 2: A meeting with the CDDO is scheduled to determine eligibility and to discuss Targeted Case Management service options within the area. Step 3: An agency or service provider is selected by the individual seeking services. The CDDO will make a referral to the appropriate agency or service provider of their choice. Step 4: If Arrowhead West, Inc. is selected; a meeting with the Arrowhead West, Inc. Division Manager in their area is scheduled to identify necessary and appropriate services. Step 5: Once all the necessary prerequisites have been completed, services will begin. For more information on Arrowhead West, Inc. services or to tour our facilities, please contact the Division Manager at (620) 225-4061 Western Kansas Division, (620) 933-2212 Mid Kansas Division or (316) 722-4554 Central Kansas Division. For more information on I/DD eligibility and the CDDO requirements, please call (620) 227-8803 or (620) 933-2215.